The Costing Templates for Excel assign individual or average costs to production or services and apply overhead recovery including depreciation to each product or service. Includes benchmarking of other company cost expense ratios. Calculates depreciation rate per hour for assets in use. Calculates the full hourly paid rate per employee. Budget raw material cost rates and total costs. 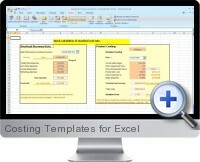 The Costing Templates for Excel automates the calculations of standard costs for any product of service. The currency can be changed to any symbol by opening the Format menu in Excel and selecting Cells from the drop down list.